When you want the quickest and most current report on real estate, you must turn to the pending home sales report. 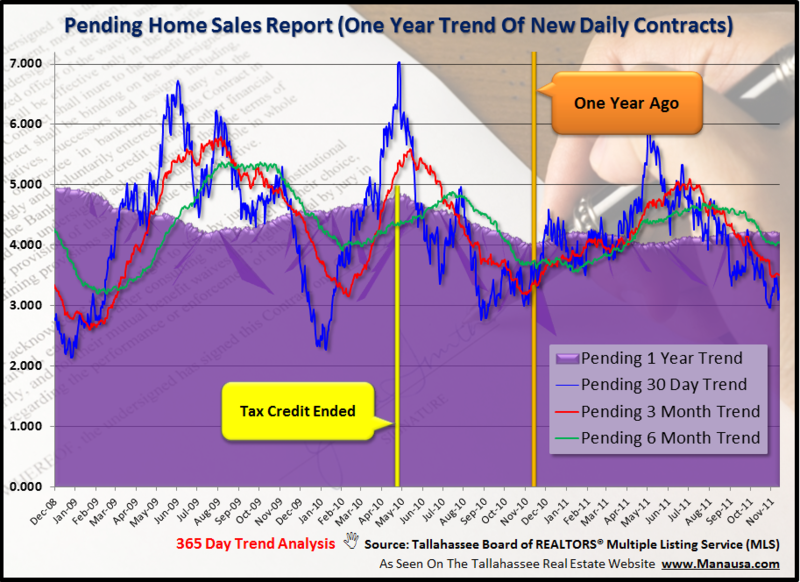 The Pending Home Sales Index published by the National Association of REALTORS runs 25 to 30 days after the data has been recorded, whereas the Tallahassee Pending Home Sales Report is published frequently, with only a 2 day lag in the data. Fortunately for those readers outside of the Tallahassee housing market, our information often parallels its counterpart report on real estate across the entire US. 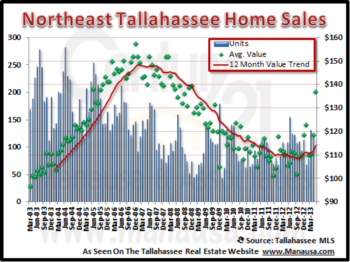 Tallahassee appears to be a comparable microcosm of the US housing market, thus our trends here will often mirror the national trends. That means unless you are in an area that has been moving contrary to the US housing markets, the conclusions here can also be tied to your local housing market. The Pending Home Sales Index and our Pending Home Sales Report both measure new contracts for purchase of homes in the various MLS systems. 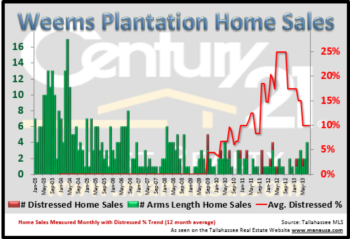 The Tallahassee MLS tracks properties under contract, and we refer to them as pending home sales. Because we are measuring the most recent activity of buyers in the market, we feel it is the most current report on real estate that we can study. Basically, it allows us to forecast what will occur over the next couple of months. In graphical report on real estate above, the field of purple measures the one-year trend of pending home sales every day in the Tallahassee MLS. That means that any point you choose on the graph, the purple field reports 365 days worth of information (averaged to 1 day) and thus all seasonality has been removed. The current on year trend is on the decline most recently. Notice how all of the shorter trends are lower than the next higher up trend? This is a clear sign of a report on real estate showing the market slowing. But when we compare where each trend is today versus where it was just a year ago, we find that all but the 1 month trend is higher. This could mean that the market was stronger than a year ago up to November, but now things are slower than they were a year ago. I believe we are seeing new contracts cooling off at a faster rate than expected, but hopefully the people who want to close on a home before the end of the year (to take advantage of tax benefits) will step up and correct this poor recent trend. We will know the answer to this soon, when we look at the next report on real estate using the Pending Home Sales Index.